Falafels are deep-fried balls traditionally found in Middle Eastern cuisine, usually made from ground chickpeas, though some variants contain broad beans or fava beans. Hot and crunchy on the outside, fluffy and herby within, they are enjoyed by people all across the world. Most often seen served inside a pita, wrap or flatbread, falafels are no longer simply fast food for vegetarians and vegans, but also as a popular snack or an exciting addition to a wide variety of dishes. They are a great source of protein, nutrients and fibre. Falafels are made primarily from chickpeas, fava beans or a combination of the two. Chickpeas are naturally rich in proteins, soluble fibres, and are a complex carbohydrate. 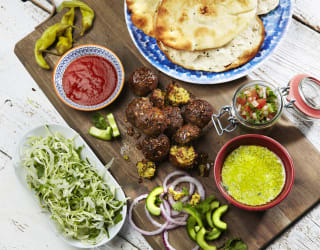 Falafels generally contain a range of herbs, spices and other ingredients, such as onion, parsley, coriander, garlic purée, cumin, black pepper, flour and vegetable oil. 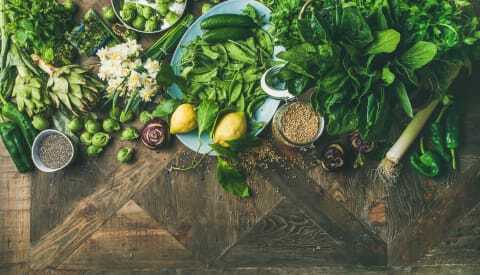 There are a number of health benefits associated with high fibre foods – they help lower blood lipid levels such as cholesterol, reducing risks of heart diseases, as well as lowering your risk of colon cancer. Falafels are packed with a number of key nutrients including calcium, iron, magnesium, phosphorus, potassium, zinc, copper, manganese, Vitamin C, Vitamin B and folate. The exact origin of falafel is unknown and open to debate. One theory is the dish was invented in Egypt using fava beans, with the recipe then exported to other areas across the Middle East. It is thought the dish later migrated northwards towards the Eastern Mediterranean, where chickpeas were brought in to replace the original fava beans. The use of chickpeas is still predominant in most Middle Eastern countries today – it’s this version that is most popular in the UK, with all our falafel products made from recipes containing chickpeas. The Egyptian variety of falafel still uses fava beans as its core ingredient. Traditionally, when chickpeas are used to make falafel, they are generally not cooked beforehand. Cooking the chickpeas in advance can cause the falafel to fall apart, which means extra flour has to used as a binder. 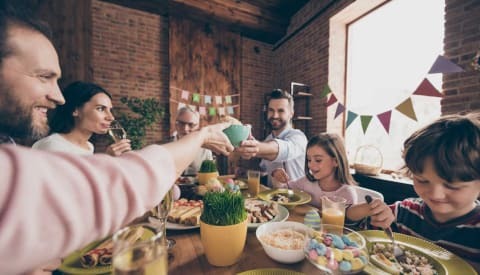 Instead, they are soaked – sometimes with baking soda – overnight, then ground together with various ingredients such as parsley, spring onions or garlic. Spices such as cumin and coriander are often added for extra flavour. The final mixture is shaped into balls or patties. This can be done by hand or with a tool called an aleb falafel – in other words, a falafel mould. The mixture is usually deep-fried, but it can be oven baked. Typically, falafel is ball-shaped, but a common variant is doughnut-shaped. The inside of falafels are usually yellow or green, with the colour coming from herbs such as parsley. There are many ways of serving falafels, but they are often served with flat or unleavened bread with tomatoes, lettuce, cucumbers and other garnishes, and commonly accompanied by tahini. For further serving suggestions, check out our favourite falafel recipes. If you don’t have time to make your own, we have a selection of delicious falafels available in all major supermarkets. We offer three main variants in our falafel range – our regular Falafels are made with chickpeas and packed with tasty herbs and spices, including coriander and cumin. They are certified vegan. 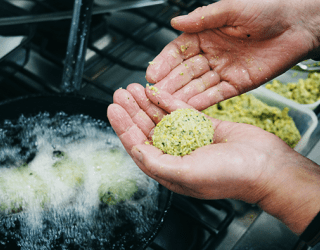 Our Persian Falafels are also certified vegan – they incorporate delicious Turkish influences in Middle Eastern cuisine, bringing together the fragrant flavours of tomato, fennel, mint and lemon zest. Finally, our Moroccan Spiced Falafel Bites are inspired by an authentic Middle Eastern recipe incorporating apricots, dates, a touch of chilli and mixed Moroccan spices. As they also include honey, they may not be suitable for some vegan diets. All our falafels are ready to eat – they can be eaten cold as a snack straight from the pack, warmed through and added to a dish or shared as part of a tempting mezze with friends!